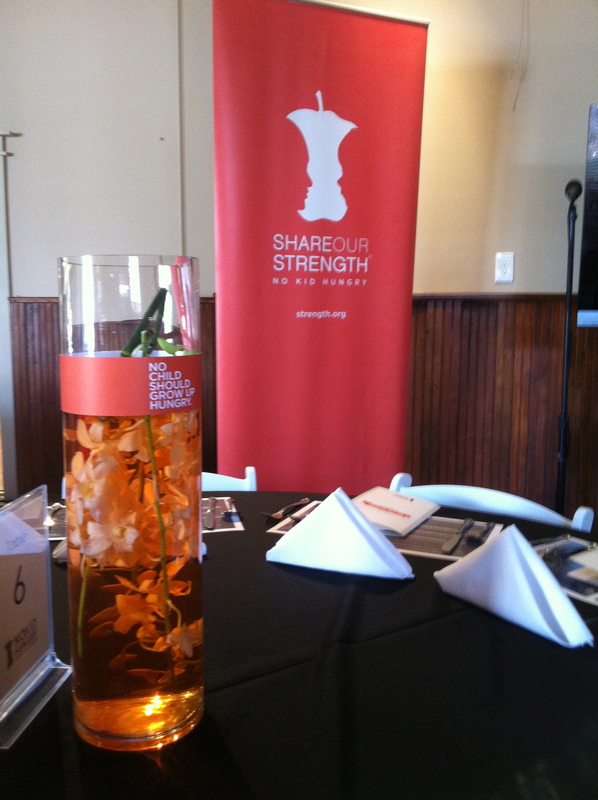 Lovely table settings by Share Our Strength staff and volunteers. Tuesday night, Governor Mike Beebe told a sold-out crowd at the Oxford American headquarters that Arkansas has become a success “poster child” for the No Kid Hungry program of Share Our Strength, the nonprofit group working to end childhood hunger in America by 2015. And based on the results of the event, raising over $30 thousand with a night of spectacular culinary achievement, I am not at all surprised. The local chef rock stars who cooked for the event included Jeffrey Owen of the Capitol Hotel, Brian Deloney of Maddie’s Place, Kelli Marks of Sweet Love and a host of rising-star culinarians and other volunteers. 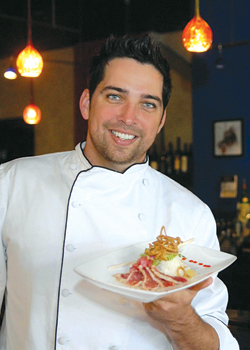 The out-of-towners included two Top Chef graduates: John Currence of City Grocery in Oxford, Miss. (Top Chef Masters, season 3) and Marcel Vigneron of Modern Global Tasting Inc. in Los Angeles (Top Chef, season 2). Share Our Strength is holding other No Kid Hungry Dinners across the country to raise funds for their worthy programs, including the Cooking Matters program I had the privilege to teach this summer. The secondary purpose, however, is to create a buzz, getting folks together who love to cook, love to eat and love to make sure our kids have the opportunity to do both. Behind the scenes was an absolute hoot. The best thing about being one of those up-and-coming culinary types is being able to schlep into these things as extra hands, learning from everyone there. I was able to help plate dishes, wipe other dishes down (the rental company didn’t send them all clean! ), even deliver dishes to the waiting crowd of about 120 guests. The other chefs all brought their own passions, as well. Currence was especially passionate about the Cooking Matters program, telling me about the Chefs Move to Schools kickoff event he helped cook for at the White House earlier this year. He said it was essential that we work to get kids excited about healthy cooking, just as previous generations of kids were the family catalysts for litter control and recycling. Our own local chefs created amazing dishes, as well. Owen’s cocktail-hour appetizers reflected the precision and depth of flavor that embodies the Capitol Hotel. Deloney presented the first course, a “muffaletta” napoleon of heirloom tomatoes, showcasing the beauty of fresh, seasonal ingredients. Newcomer Kelli Marks astounded the seasoned veterans with her light, perfectly balanced cheesecakes. (Vigneron loved them.) And without credit on the program, former Argenta Market chef Shane Henderson, now with Ben E. Keith, prepared beautiful vegetarian entrees on the fly for those who requested them. Before the event even got rolling, the former-PR-person in me had to go work the crowd during cocktail hour. Turns out I walked by just as P. Allen Smith was walking in, as he was one of the guest speakers for the event. Bless his heart, the awesome ladies who came in from Share Our Strength in Washington, D.C. didn’t know who he was! I helped them all alleviate the situation without anybody getting embarrassed. My reward: Soiree and the Dem-Gaz snapping photos of me with said Mr. Smith. The white coat, they love it, even if I’m a nobody. I may write a separate post about just hanging out with these awesome folks all evening. It’s a story unto itself. But, for now, enjoy these photos knowing that we’re this much closer to No Kid Hungry in Arkansas. Host Chef Donnie Ferneau of Rocket 21 and I will be dishing it out. Or maybe I’ll just be delivering his stuff. We’ll see. Hey kids, it’s not too late to join us (actually, it is…sold out!) at the No Kid Hungry Dinner tonight, benefiting the No Kid Hungry program of Share Our Strength. As I’ve said before, my firsthand experience with Share Our Strength through its Cooking Matters program has given me a little bit of insight as to just how powerful their work is. I hope you’ll join us. Now, the really fun part. I offered a while back to help with this dinner, maybe plating or otherwise helping with the cooking and prep process. In events past, this has given me a great opportunity to get some food practice and also live-blog events (such as Chef Ball) from behind the scenes. I just found out that I’ll need to be really flexible tonight, maybe even waiting tables. Lemme just tell ya, this is not my forte. I did it (and actually quite enjoyed it) at my recent stage at Caribe, but that was a casual restaurant, not a formal fundraiser thing. This could get interesting! I could get into that horrible story that I never even could bring myself to blog about in Food Production IV where things went terribly wrong, that day I was front of house, and most of it wasn’t even my fault. But I won’t. I’ll just do my best and help however I can to keep kids in Arkansas from having to go hungry. P.S. Follow me tonight on the Twitters at @ARFoodie for any live tweeting I might be able to squeak out. If I’m on the floor, don’t expect much. More photos and such to follow here, after the event. P.P.S. I just found out that P. Allen Smith will be there! Does that dude follow me around or what?